How profitable is your business? And how can you tell? Of course, we can first take a look at your company’s financial statements. After all, that is the information that is reported to various tax jurisdictions. And these financial statements are the basis of ratios that affect the stock value of public companies, ranging from the gross profit margin, to operating margin, to net margin – and various contribution margins depending on the detail included in each calculation. But the financial statements don’t tell the entire story. Plus, the financial statements can be different, depending on the tax regulations of different countries and the accounting principles in place, from IFRS to various country-specific GAAP (generally accepted accounting principles), to localized rules and regulations. Additional information is needed to make management decisions. Which customers are the most profitable – and are you including expedited shipping, or even returns, in that calculation? Are your product lines cannibalizing each other? Which regions are the most profitable – and is that driven by specific products or customers? The profitability analysis module (CO-PA) in SAP S/4HANA Finance allows you to drill into the details of your company’s profitability. There are two ways in which CO-PA can be configured – cost-based and account-based. And yes, you can run them in parallel. Cost-based profitability analysis, which was developed first, supports cost of sales accounting. That means the cost of goods sold is matched to the revenue, so COGS is recorded at the time that the product is sold and invoiced. You can look at margins down to a sales order item level. That being said, the reconciliation to the General Ledger is more difficult, since several cost elements (or accounts) may flow into one value field in CO-PA. Also, there may be timing differences, in cases where the cost of goods sold is posted in the General Ledger in a prior period, yet is not recognized in CO-PA until the invoice is posted in a subsequent period. Account-based profitability analysis was introduced subsequently, to help with the reconciliation of CO-PA to the General Ledger. It supports the period accounting concept, where the values in CO-PA directly map to the values in General Ledger accounts, so the timing differences of COGS does not occur. Since there is a 1:1 correlation between the G/L accounts in your financial statements and in CO-PA, you may not have as much some detail, such as breaking out fixed and variable cost of sales, since this is a sub-set of the G/L account level. With SAP S/4HANA Finance, more development effort has been put into account-based profitability analysis. The tables of account-based CO-PA are now incorporated into the Universal Journal. This continues to provide the reconciliation to the G/L. It also affords you the ability to look at additional details, such as costing information including cost centers and projects; and breaking down the cost of sales into categories such as labor, materials and overhead. If you are running cost-based CO-PA, you can continue to run it for your management information. Optionally, you can migrate from cost-based CO-PA to account-based CO-PA, if it meets your needs, but this will require implementation effort. Cost-based CO-PA will continue to be supported. 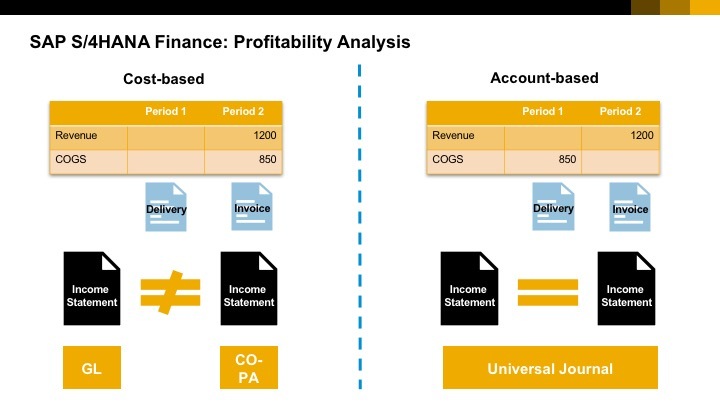 If you are running account-based CO-PA, you can migrate to the Universal Journal in SAP S/4HANA Finance, with available migration tools. Future development efforts will focus on account-based CO-PA.
And – most importantly – you can run both cost-based and account-based CO-PA in parallel!